Christmastime is just around the corner, which means that, soon, Icelandic publishing houses will be releasing hundreds of new titles onto the Icelandic book market, commencing a unique tradition known as the jólabókaflóð, or the Christmas Book Flood. Throughout this bustling and much-anticipated yearly event, bookstores across Iceland resemble miniature concert venues, where Icelandic authors of all genres read from and promote their latest work, transforming the holiday season into an extended city-wide literary festival. This charming tradition has recently started capturing international attention, especially through facebook; a series of widely-shared memes on the social networking site advertises and explains how Icelanders traditionally exchange books on Christmas Eve and then spend the remainder of the evening reading at home. A cherished staple of Icelandic holiday festivities, the Christmas Book Flood truly is a distinctive celebration of literacy that has a fascinating, yet little-known history. During World War II, restrictions on imports to Iceland were harsh. Moreover, Icelanders did not have the proper currency to purchase foreign products, which severely limited their gift-giving options around Christmastime. However, these limitations did not apply to the local book market, so the tradition of exchanging books during the holidays naturally arose as a result. With a tiny population of just over 330,000, Iceland’s publishing industry has, until very recently, lacked the resources to publish and distribute new books all year round, making the Book Flood a practical marketing strategy as well as a treasured tradition. Now Iceland represents one of the most prolific book-publishing countries in the world, as hundreds of bookstores and literary circles have been established all over the country. Many Icelanders will publish a piece of writing in one form or another during their lifetime (a book, a newspaper article, a poetry collection, etc. ), and the island inhabitants also read more books per capita than any other people in the world. Not surprisingly, the book-loving island nation enjoys a sky-high literacy rate, demonstrating the value of integrating literature and reading into a nation’s cultural identity. Releasing hundreds of titles annually in a microcosmic country like Iceland inevitably leads to a backlog of books and occasionally Iceland’s largest publishing houses have had to flush out or destroy their excess inventory, leading some to question whether Iceland’s Book Flood tradition is more wasteful than wise. To eliminate this surplus, Icelandic publishers are starting to develop a more prominent and efficient year-round paperback book market in hopes that it will equalize supply and demand. However, Iceland’s Christmas Book Flood will likely persist for decades to come as its popularity grows and it becomes more inextricably linked to the nation’s international identity. And both Icelanders and book lovers from all across the globe are probably content with that. Anita Arneitz is a writer from Austria who participated in 2016 Iceland Writers Retreat. An avid blogger, Anita recently wrote a blog post reflecting on her time at the Retreat. The blog also has several pictures and a video of readings that were given. 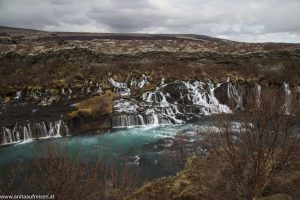 In addition to detailing the extraordinary aspects of the Iceland Writers Retreat’s writing workshops, including the advice given by successful writers and insights into the workshops, Anita describes the vibrant literary traditions of Iceland. The traditions, like the landscape, are captivating and inspirational. She articulates that “Like a geyser, [ideas] bubble on the inside and are just about to burst out”. Anita’s blog most poignantly illustrates the camaraderie among the participants and faculty, novices and literary veterans alike. So much diversity inevitably leads to interesting story-sharing, but these interactions take place on common ground. Everyone is there to learn and create, escape and explore. Iceland Writers Retreat named one of Iceland’s most interesting start-ups! 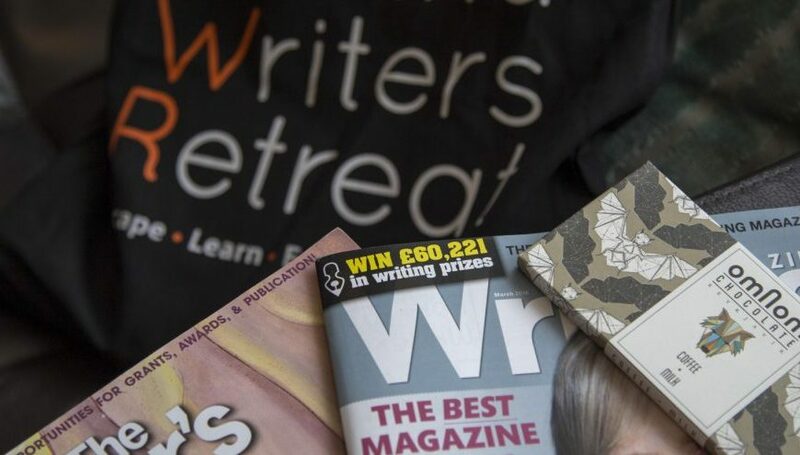 “It’s an event for everyone who enjoys writing, not just for published authors“, say’s Eliza Reid, co-founder of the Iceland Writers Retreat in her recent interview for Frjáls Verslun, Iceland’s leading business magazine. The two-page story, which lists the Iceland Writers Retreat as one of their top 100 most interesting start-ups, details the event’s story from inception to first reception in 2014, and highlights how the program, with its compelling combination of workshops led by well-known authors and literary-themed adventures into the Icelandic countryside, has been attracting new groups of visitors from all over the world and helping to establish Iceland as a great destination for those who love writing and literature. 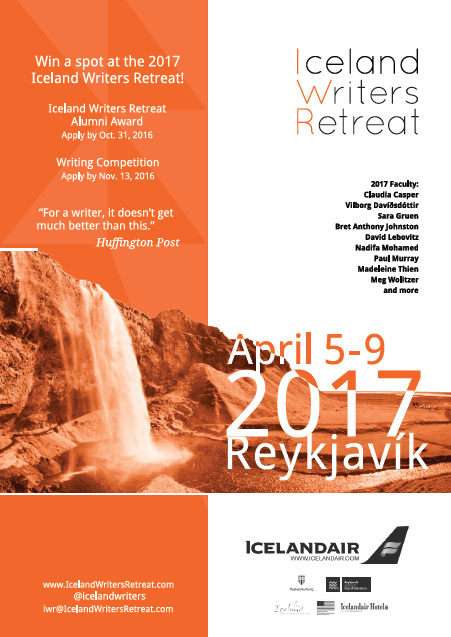 Three Chances to Win a Free Spot at the Iceland Writers Retreat! One award and two writing competitions will help some very talented and lucky writers attend the 2017 Iceland Writers Retreat. They all have deadlines that are quickly approaching! The Iceland Writers Retreat Alumni Award is given to one or more writers who demonstrate both merit and financial need. Full funding covers all expenses to participate in the retreat, including transportation and accommodations. Partial funding covers just the participant fee, which does not include accommodations nor transportation. The deadline is Monday, 31 October, 2016 by 23:59 (PST). For more information on eligibility, please visit click here. 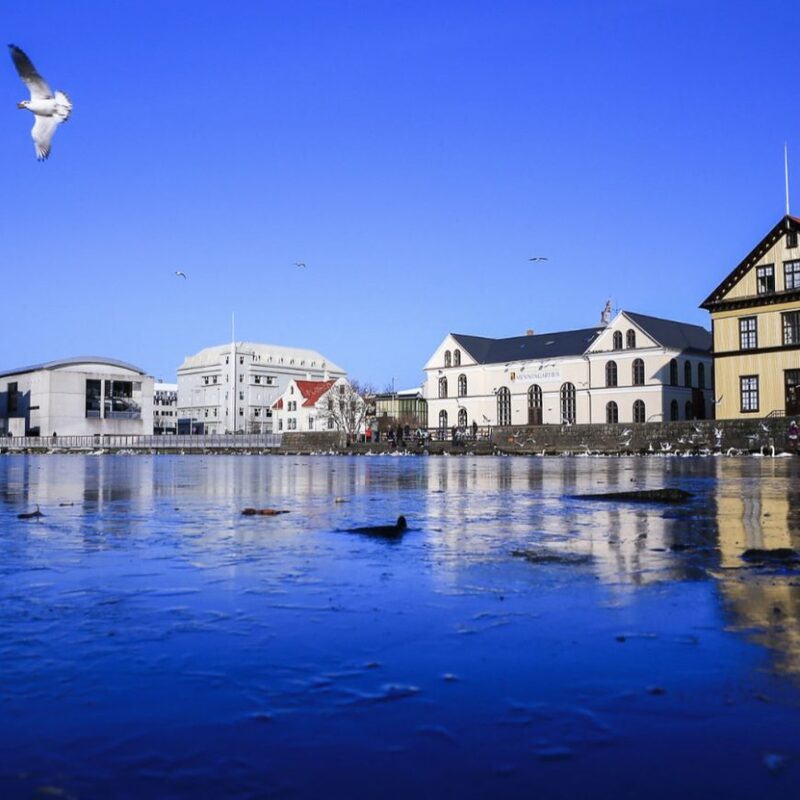 The Iceland Writers Retreat writing competition is awarded to one person based on the quality of their written submission (essay, story, or poem) that engages with the theme “Iceland – Regard the Moon”. The winner will receive a free retreat package, which includes the participant fee and accommodations. Please note that the winner will still have to pay for transportation. The deadline is Sunday, 13 November, 2016 by 23:59 (GMT). For more information on guidelines and submissions, please click here. Writing Magazine is hosting a separate writing competition with the theme “Elements”. The winner will receive a free retreat package, which includes the participant fee, accommodations, and a round trip ticket from the UK. Anyone can apply for this, but the transportation is only from the UK. The deadline is 00:00 Friday, 2 December, 2016. Please note that the entry cost for this competition is £5.00. Words and Photos by Elliott Brandsma. 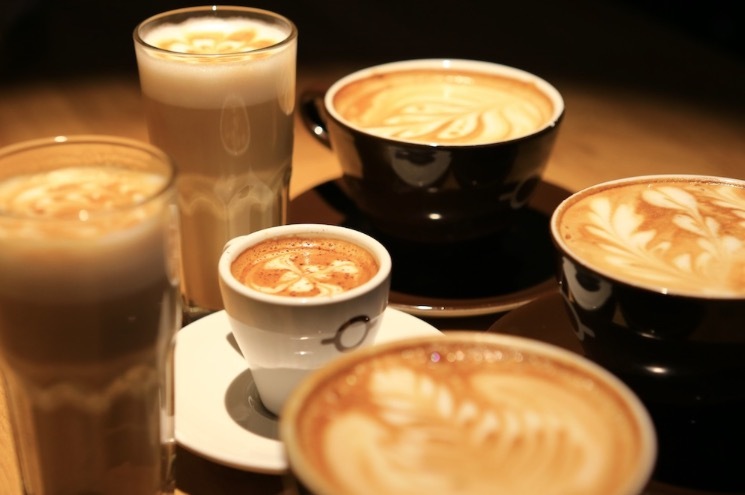 Iceland’s cool, windy climate has made coffee the beverage of choice for most Reykjavík residents. As a result, the island nation’s bustling capital city boasts a flourishing coffee shop culture, with unique cafés lining seemingly every street in the downtown area. 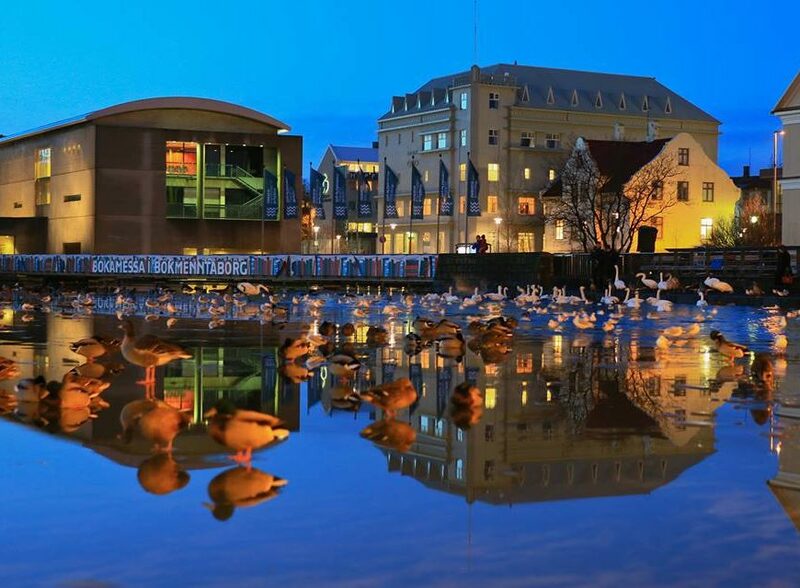 As winter fast approaches, the Iceland Writers Retreat has gathered a list of five cozy coffee joints in Reykjavíkʼs city center, where writers of all tastes, styles, and temperaments can grab a cup-of-joe while typing up their literary masterpieces. Café Babalú, Skólavörðustígur 22A. Located just down the street from Hallgrímskirkja, the towering church in the center of town, Café Babalú is a quirky two-story coffee house adorned with an eclectic array of furniture and visual art. When the sky is sunny and clear, this casual coffee joint’s balcony becomes the perfect place to enjoy a light lunch, followed by a relaxing afternoon of writing or reading. A hot spot for hipsters, tourists, and locals alike, Café Babalú represents the ideal location for authors who write best in and draw inspiration from unconventional environments. Reykjavík Roasters, Kárastígur 1. Often named one of Reykjavík’s coolest coffee shops, Reykjavík Roasters is a small, unassuming venue near the center of town with a big reputation for making exceptional lattés, espressos, and hot chocolate. The layout of this hidden gem is clunky and congested, making finding a seat during peak hours difficult, but if you’re lucky enough to secure a table, prepare yourself for one of the most authentic and enjoyable coffee shop experiences in Reykjavík. Reykjavík Roasters attracts a diverse crowd of customers, and its compact, snug atmosphere is perfect for writers who welcome occasional distractions. Stofan Kaffíhús, Vesturgata 3. Spacious, warm, and comfortable, Stofan Kaffihús—which is located inside a renovated antique store—is a staple in the Reykjavík coffee scene, a café known for its rugged charm, cozy atmosphere and scrumptious deserts. Situated just a block away from the capitalʼs largest library, the laid-back and trendy vibe of this coffee shop makes it a great space to work on a novel, type up an essay, or compose a blog entry. At night it turns into an energetic bar, where local artists, writers, and musicians like to hang out and socialize. Try ordering a piece of Stofan’s rich chocolate cake or scrumptious carrot cake to accompany your afternoon cup of coffee. You wonʼt regret it! Kaffibrennslan, Laugavegur 21. Conveniently located on Reykjavík’s busiest shopping street, Kaffibrennslan is a lively coffee shop with a wide selection of not only coffees and beverages but also breakfast and lunch options, making it a great spot for authors who prefer starting early in the morning and working into the afternoon. If you enjoy typing in a cozy, more intimate setting, then take your laptop upstairs to escape the hustle-and-bustle of the café’s ground floor. If you are partial to more active environments, the ground level is the best place for writers who draw inspiration from observing others and listening to the pleasant sounds of daily conversation. Kaffitár, Bankastræti 8. Brightly-decorated and always busy, Kaffitár on Bankastræti is one of Reykjavíkʼs hippest cafés. Closely situated near some of Reykjavík’s trendiest shops and restaurants, this dynamic coffee shop is a suitable destination for writers on-the-go who often have to steal time to work on their projects. Customers of all kinds frequent this recently-rearranged café—students and writers, travelers and professionals, natives and expats—ensuring a unique experience and atmosphere every time you visit. Aside from offering a wide selection of coffees and desserts, Kaffitár also serves delicious teas and light lunch dishes to satisfy those afternoon cravings. The Iceland Writers Retreat welcomes one Social Media and Marketing Intern each year. This intern helps maintain social media and promote the various aspects of the Iceland Writers Retreat. 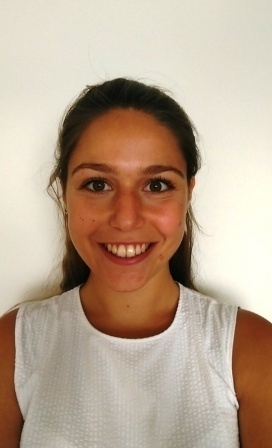 This year’s intern is Adriana Sgromo.